Offshore drilling dates from the late 19th century in the Caspian Sea off Baku. Fifty years later the practice spread into the shallow waters of the Gulf of Mexico and in the first half of the 20th century became a common, worldwide practice wherever the water depth was shallow enough to feasibly access underlying oil formations. Today, America gets roughly one third of its oil production from off shore wells in the Gulf of Mexico. Many other portions of the American coast are considered promising for oil production but, for both environmental and esthetic reasons, offshore drilling is generally prohibited elsewhere in the United States, except in Alaska. Offshore drilling technology continues to evolve, allowing the industry to place wells in deeper and deeper water. A decade ago, a well that went 1000 feet through water to the ocean floor was considered deep. Today, wells often operate in water depths of a mile or more. Offshore drilling companies today build pipe casings the height of Mount Everest that must be strong enough to remain stable and leak-free in the face of tides, currents, storms, and the upwelling pressure of liberated oil and natural gas. Deep water drilling has made possible a whole new generation of oil fields, off the coast of Russia in the North Pacific, far out to sea east of Brazil, off the coast of Ghana, as well as in the deep water portions of existing fields like those in the Gulf of Mexico. 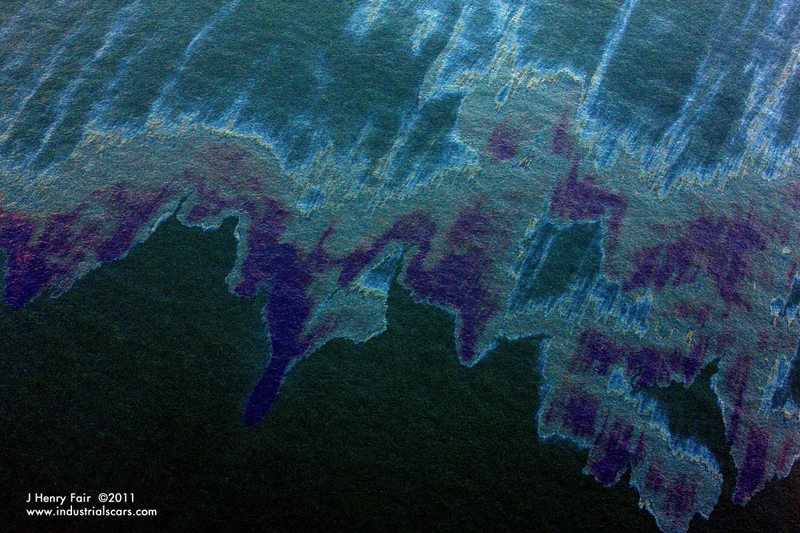 Unlike other energy industry impacted landscapes, where scars on the surface are a fundamental part of extraction activity, much offshore drilling proceeds without a visible mark on the seascape. 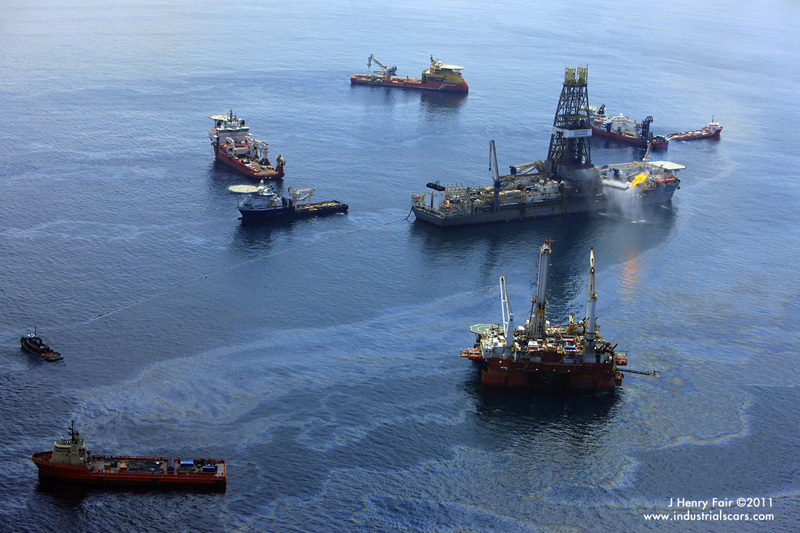 However, the marine environment is extremely vulnerable to many of the industry’s day-to-day drilling practices and is especially threatened should an accident occur. 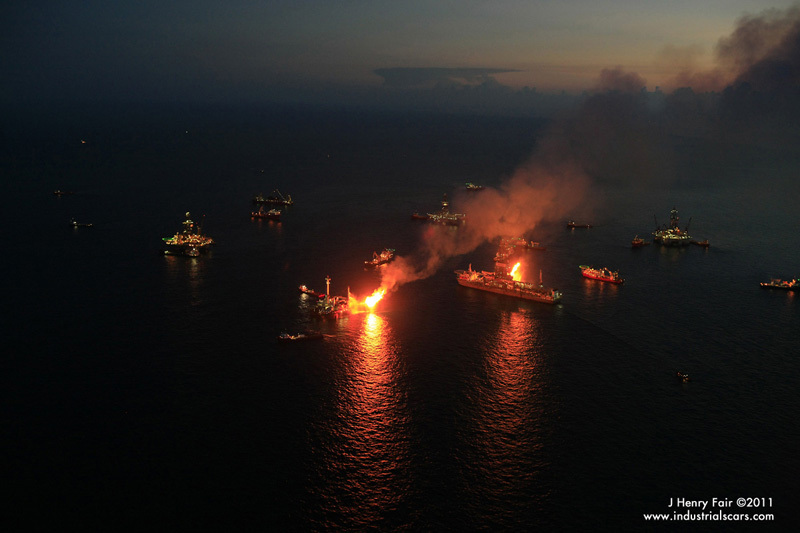 The Deepwater Horizon disaster in the summer of 2010 in the Gulf of Mexico was a dramatic example of that ongoing peril. Accidents were generally less severe when the industry was operating in only several hundred feet of water. 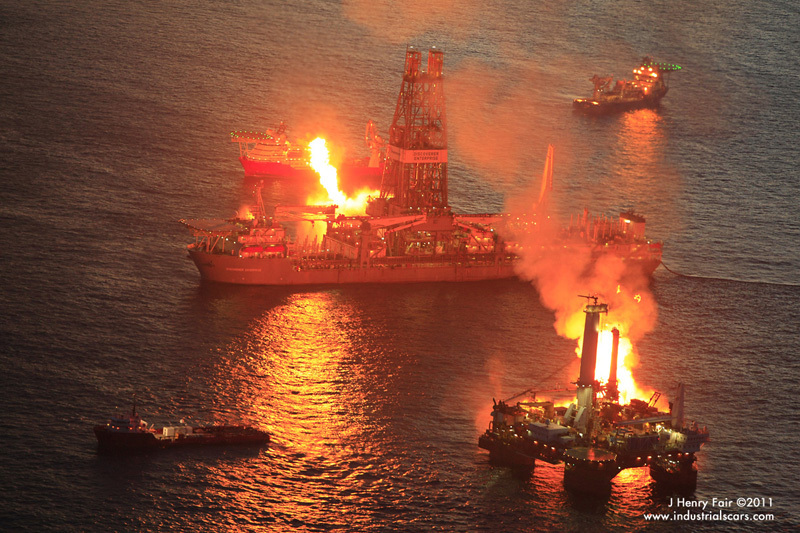 The risks are far greater with the new generation of deep water drilling. When oil is released in the environment, it tends to stay in the environment. Oil is composed of many complex molecules and until the industrial era it has been a relatively uncommon substance on the earth’s surface. Consequently, few species of bacteria have evolved to biodegrade oil. Because such microbial action is limited, it can take many decades for nature to break it down. 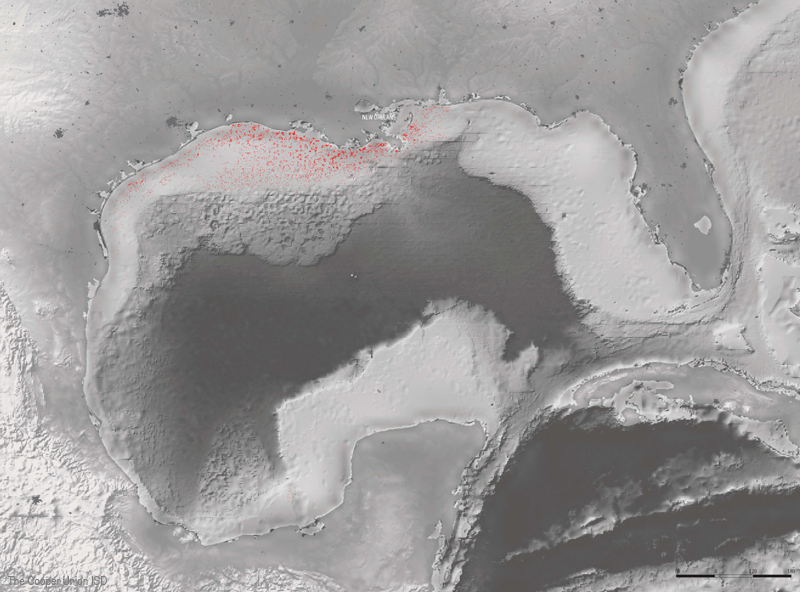 Oil remnants from the 1990 spills off the coast of Staten Island are still present in significant amounts in the local beach subsurface sands and sediments. Offshore drilling indirectly alters the landscape as well. Onshore industrial support facilities, refineries, pipelines, docks and boatyards are located on coastlines as near to the offshore drilling as possible, and they often occupy sensitive wetlands sites, require dredging and channelization, and create concentrated hotspots of dredge spoils and oily water. 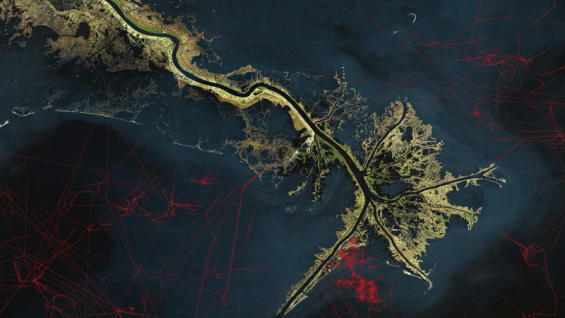 It is thanks to such intense industrial activities that the coastline of Louisiana is eroding faster than any other shoreline on earth, losing on average 50 square miles per year. 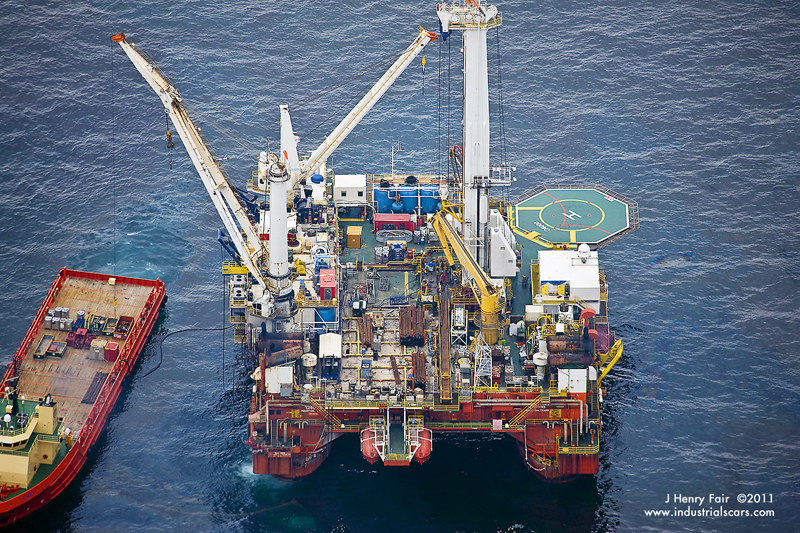 Deepwater offshore drilling is considered one of the future growth areas of the oil industry. Attempts are now underway to allow Macondo-type oil wells in many areas. Particularly disturbing is the fact that the Deepwater Horizon disaster seems to have had no cautionary impact on the pending proposals to do deepwater drilling in the freezing waters of the Beaufort Sea north of Canada and Alaska. Should a Deepwater Horizon scale drilling accident occur in those waters, the ecological damage would far exceed that in the Gulf of Mexico. The recovery time for nature would be measured in the hundreds or perhaps thousands of years. Q4000 multi-purpose vessel at the BP Macondo spill site. Distant view of operations at BP Deepwater Horizon spill site, the largest oil spill in the United States. 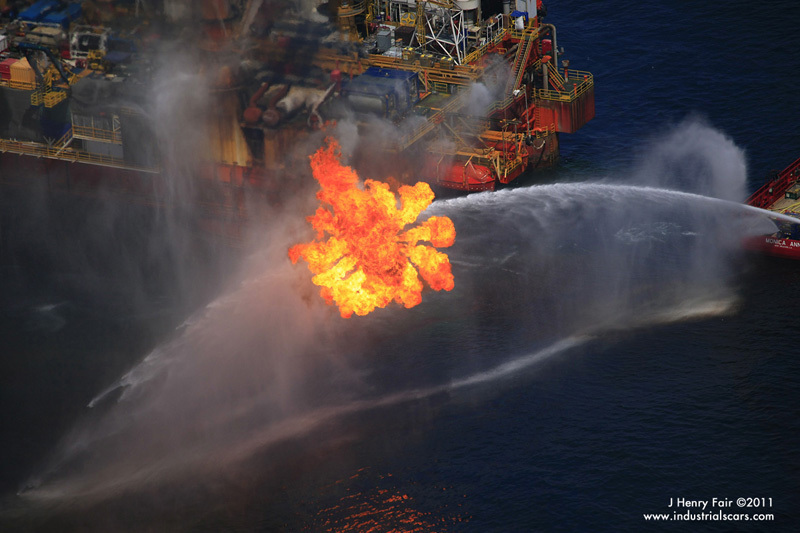 Drill rig Q4000 with flare burning gases captured from the leaking BP Macondo well a mile below the surface. 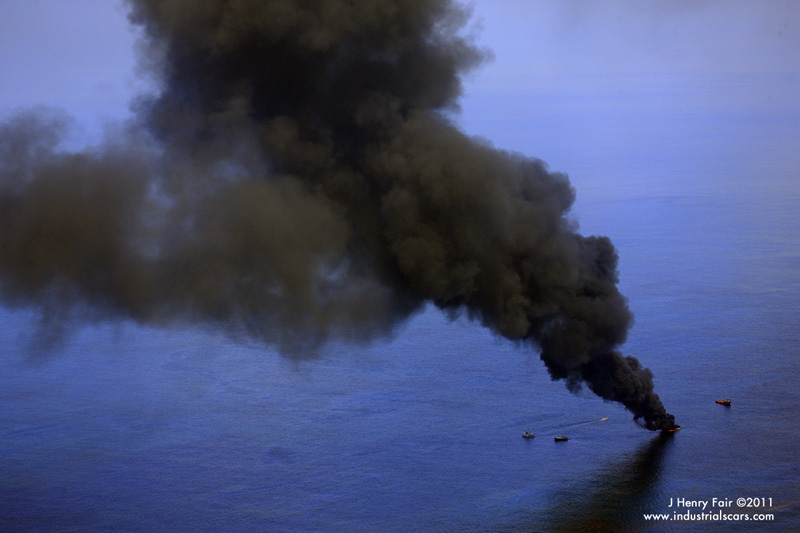 Burn-off of oil collected from the BP Deepwater Horizon spill. 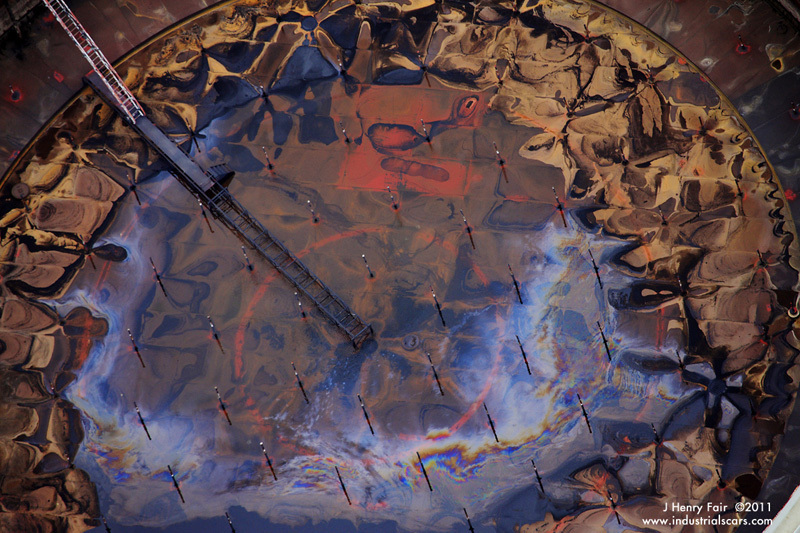 Dusk view of floating oil at the Deepwater Horizon spill site. Top of an oil tank at the Chevron Pascagoula Gulf Coast refinery. 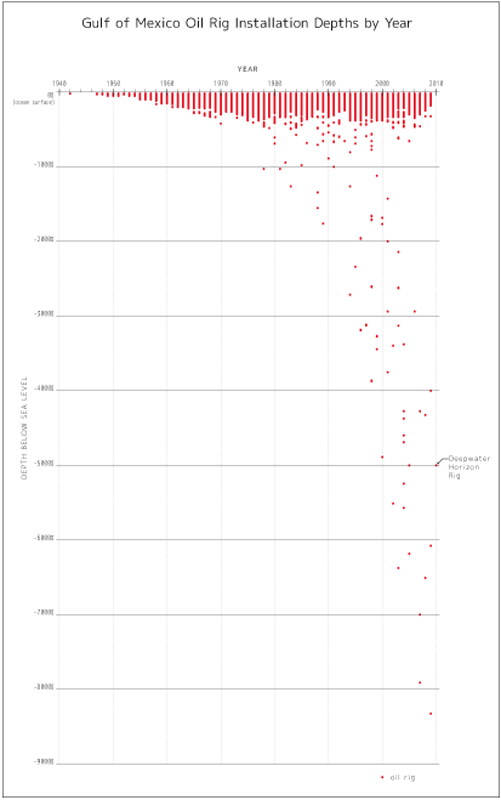 Gasses captured from the leaking Macondo well are flared by Transocean drill ship Discoverer Enterprise and rig Q4000. Clouds over the Deepwater Horizon spill site. 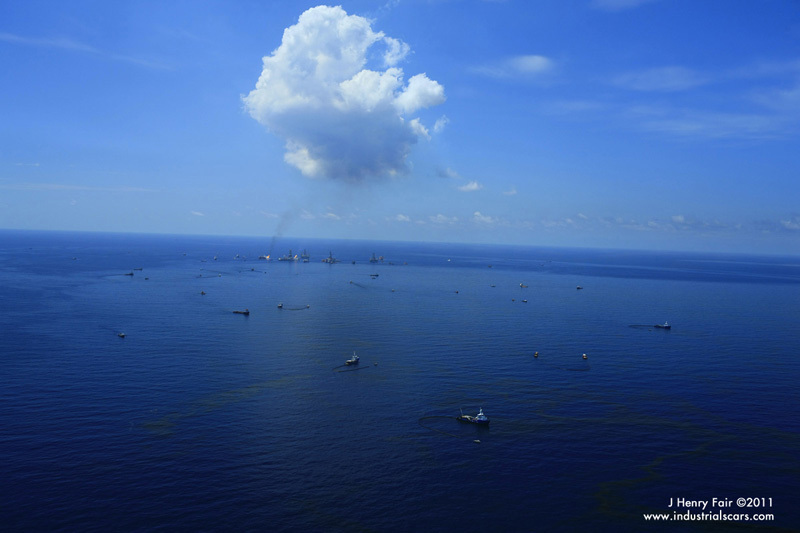 These clouds form as a result of heat and pollution from the burning oil.